Yellow Pages - ZineWiki - the history and culture of zines, independent media and the small press. 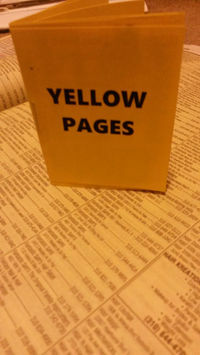 Yellow Pages is a micro zine created by Kari Tervo. It was published in California, U.S.A. in October, 2014. It is 16 pages, and printed on yellow paper. It contains movie references, jokes, and fun finds, all created with information from that classic telephone resource, the yellow pages. This page was last modified on 6 April 2015, at 00:38.